I plan on writing at least once a week and posting every Sunday at 6:30. It’s a form of release for me. But more importantly I’m hoping it will help people. Since the last time I wrote, Fathers Day has come and gone.. Last year we were in the hospital. Gabby told Carolynn to go get me a Green Lantern comic book and two boxes of junior mints. I still have the book and haven’t eaten junior mints since. I was worried as this day approached. I told myself I would be strong for the girls, wear a smile. The weird thing is even though I felt the pain I wasn’t a total train wreck. The girls made me breakfast, got me a Lego set and drew me pictures. I smiled and meant it. It wasn’t that I was healed it was the fact that they needed it more than me. Next up is my birthday next month. Our life’s now revolving around trying to get through holidays and special events. Once we get through all of these holiday’s one time, we will know what to expect for future holiday’s. I accepted a job and started work this past Monday. I will spend the next three weeks away from home. The first week was rough. I hit an all time low. I was filled with anger and jealousy because I kept asking why am I the one that has to be strong and join the real world. I did it and will continue to do it because I need to take care and support my family. The Tuesday before I started work I made a number of very strong drinks and wallowed in self-pity. I got through the night and told myself it wouldn’t happen again. All I really want to do is teach. The state of Delaware has approved me to teach business education classes to the schools in the area, however no positions are open. I plan to go back to school and get my masters and hopefully teach elementary education. The first time I felt truly good about being around other kids was when I was helping coach Maddie’s softball team. The kids would look at you and really appreciate the help you wore offering. I have wanted to teach since I was in high school. Now at 39 I’m worried it’s a silly idea to start over and enter a new career. So for now it’s back to a suit and tie and banking. As I said I was filled with anger and jealousy. It was directed at Carolynn. I’m ashamed to say it but you should all know by now I’m extremely open about most of my feelings. When we first moved to Delaware Carolynn’s parents would ask her if John found a job yet? Never did they ask her if she found a job. Carolynn has been a stay at home mom since Katie was born. Almost 9 years. Now that Gabby has earned her wings the plan was we both go back so I didn’t have to take a job I really didn’t want to. But it didn’t seem to work out that way. I could tell Carolynn wasn’t really into finding a job. She filled out two online applications since we moved here. I have been interviewing since February. One night she admitted she couldn’t go back to work yet. I said I understand and would just take a job that could support us. But inside I was furious. I don’t think I can work. But no one asked me, no one said John it has to be you. It was just assumed that I’m the man so I must be strong and do my manly duty. It’s almost like people assume the mother hurts the worst. Society for the most part doesn’t believe a father can hurt as deeply. I don’t get it, I really don’t. Before Gabby got sick and Carolynn’s mom would come over, I can’t even count how many times I would complain about work or at times working two jobs. All her mom would say is “Carolynn’s job is harder or look how hard she works”. I never once said her job wasn’t. But I’m sorry I was in sales, chasing a number constantly. If you didn’t hit the number you were gone, no job, no check, no food for the family. I just wanted someone to acknowledge the stress and pressure was greater on my side. Not to mention I was working a second job teaching scuba diving at night to earn extra money for things the girls needed. And here we are now and again its just assumed John needs to pick himself up and do it again. 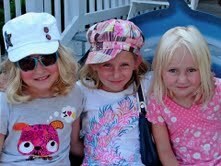 I’m jealous of Carolynn, she spent everyday of Gabby’s life with her. I worked 70-80 hours a week and saw her go to bed and said goodbye in the morning more than I actually saw her. And now it starts over. I am at work and Carolynn gets to spend the summer with the girl’s everyday. I know this isn’t a fair way to think and it doesn’t make sense but the fact that no one has said to me I am so proud that you are doing this again for your family, no matter how hard, or how many times you just want to hide, your able to go back to a business you thought you wouldn’t have to. I understand Carolynn’s mom has to defend her. I’m just tired of not getting defended as well. Carolynn will stay home and work on the foundation, she has been able to accomplishing a lot. So hopefully with all of your help we will be able to grow in the next few years that I can do that full time as well. We had the honor of meeting a family that lives close to us. Please visit their Facebook page, Pray for Grey the journey continues. Usually when people visit I hide. I didn’t do that this time. We actually entertained. The girls loved playing with the three boys and actually sounded like they were really laughing. I know Carolynn and I actually let our guard down and had a great night with his parents. Grey is fighting a tumor as well. We know so many families now, families that have lost children. This was the first family we met with a child fighting something similar to Gabby. We were nervous before they arrived. I wasn’t sure if I could look at him without crying. He and his family are amazing. So full of life and laughter. When they left Katie looked at me and said “He looks so much better than Gabby did so he must be getting better”. I looked at her and said Katie sometimes miracles happen and kids get better. I was so happy I was able to break out my marvel legend superheroes for him to play with. I bring them out for the girls and they end up in the dollhouse. Grey had them doing what super heroes are meant to do. Saving the world! As I watched Grey I smiled as he slid down the swing set and was happy to see a warrior so full of life and fight. When people ask why do we do what we do…. Visit his Facebook page. He’s just one of many reasons we are committed to helping make a difference. Lines over here, lines over there. When I was in High School I never really picked one clique to be part of. I played football but also hung out with skateboarders. I’ve never been good at picking just one group to belong to. Every person has qualities and traits that interest me. Why limit yourself for labeling yourself. Why draw a line keeping people out of your group? That’s what high school was. Preppies this way, jocks over there, band members here and artsy kids that way. I have a few ideas about Cancer and the lines it creates. At least in my eyes. * Your child gets sick, everyone you know rushes to help you. Possibly because in their minds the child can be saved, all is right with the world, now they know nothing can happen to their children. Other “Onco” families accept you, give you advice, tell you to stay strong, and stress welcome to the new normal. **Your child earns their wings, family and friends vanish, some make it seem like it’s your fault, and you became too distant or didn’t care about their feelings. Others vanish because your child didn’t get better and they don’t want a reminder kids die, their children can die. So if they walk away from you they don’t have a constant reminder that their child can be next. The real interesting thing is that there is a line like this with “Onco” families still fighting as well. Where once you were a member of the group, now you moved on to a different status. A status of what can happen. They still have children fighting and maybe it’s easier to separate themselves from parents of an angel. Because they don’t want to lose hope. And a family like mine screams the phrase, We lost the battle. Not all of them are like this, but there are a large number out there that have vanished. I could get angry about it and say are you kidding me? I lost my daughter and am still fighting for your child! But the truth is I understand. I don’t judge, I don’t draw that line to a specific group, but unlike high school this time I was placed in one. After you loose a child you actually start to feel like an outcast. No one wants to be around you. “Onco” families give advice to people to just invite yourself to visit us, call me, because I won’t call you because it takes to much energy. But the same “Onco” families that say that change when you loose a child. They start to sound like the normal people and say things like, call me if you need to talk, lets plan something. Again another line was drawn, families that lost a child to the left, families with a fighter to the right. I have a friend who told me they weren’t sure I could handle seeing their fighter? I asked why? Like I said earlier about Grey, and I was sincere we go on to fight for your children. And we won’t stop that ever! We are filled with happiness when we see a child beating this monster. It fills us with hope. Social media is a weird thing. Parents going through what we are going through ask me “How can you say those things, How can you share these moments?” The answer is easy…. It’s who we are. With Facebook I can see how many people actually saw these blogs or pictures. It varies on time, day and anything that is happening that day. Getwellgabby has 32,951 likes, but these blogs are only seen by six to seven thousand people. And that’s on a high traffic day. In order to grow we need more likes which obviously raises the actual number of people that read these. The more people we have the more possibilities there are of reaching people that may have an idea how we can get to the next level. A level where we are making a major difference. Our goal is to get 50,000 likes by what would have been Gabby’s 7th birthday. It also is Carolynn and my wedding anniversary, October 9th. 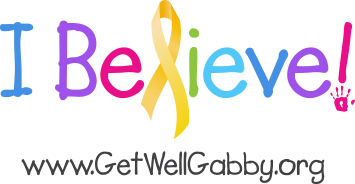 SO I ask you all to please share this page and the website: getwellgabby.org with everyone you know. Another thing we ask for is for you to show us a sign! Make a sign with Get Well Gabby Founation and Believe. Take a picture wherever you are, get creative and post it on the Facebook page. This way we can see how far Get Well Gabby has reached. If you can’t make one of your own there are also signs on the foundation website you can print and use. There are also Gabby Random acts of kindness cards you can print and hand out when you do something for a person for no reason other than wanting to help. Please consider donating to the getwellgabby foundation, tell others, we are hoping to raise at least $100,000 by December to give to finding a cure! Help us reach that goal! The new foundation shirts and car magnets are on the website as well, proceeds going directly to helping find a cure! Show your support help create the awareness all of our warriors and angels deserve. If you go back to the first blog in the hospital I used to end each blog with things that made Gabby smile. Those things became less and less as those 3 months and 12 days passed. I haven’t done it in a very long time. Maddie and Katie spent an entire day in their room’s together writing songs and them performed them for us. We have a family of woodpeckers that visit, the mother woodpecker comes to the nutlog grabs some food then flies back to a tree and you can see her placeing it in what I assume is her little ones beak. We won’t be defined by cancer. We won’t be put in a group. A line is just that something you stand in while waiting. Well we aren’t waiting we are determined to do something and we will run every direction to do it. We will talk to every group we can. It would be very easy for me to say, I don’t care I’ll accept where we are and how we are viewed. That’s not what Get Well Gabby and my family is about. I understand why this happens, but the simple truth is I won’t accept it. Because I BELIEVE we can make a difference, a change, I believe and am driven by children and families like Greysen’s and all the other fighting families. They won’t give up on their children and neither will we.